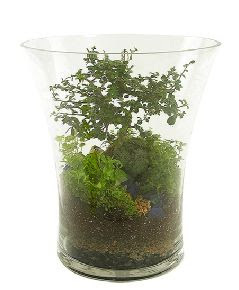 Here are some rather no-brainer tips pertaining to terrarium maintenance as featured on the Minnesota Star Tribune. The best part is that the advice comes from Mary Beth Gullickson of Bachman's- which sells adorable terrariums (as pictured above) as part of their landscaping/Floral Gifts & Gardening magical goodness. I love that little bonsai tree! You just have to live in the twin cities to order one. C'est la vie. Don't neglect pruning. "A terrarium will always outgrow itself eventually, if it's healthy," Gullickson said. "Don't be afraid to give plants a haircut. You're actually doing them a favor."